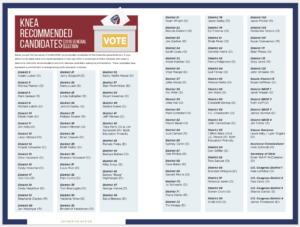 CLICK HERE for complete list of KNEA PAC recommended candidates. 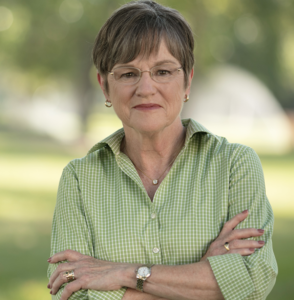 Kansas Senator Laura Kelly, a two-time recipient of Kansas NEA’s “Friend of Education,” headlines the list of KNEA PAC’s recommended candidates for November’s general election, KNEA officials announced Tuesday. Kansas NEA believes the Kelly/Rogers campaign represents a return to common sense Kansas values where public schools are a priority and where teachers are respected instead of marginalized. Senator Kelly values teachers and recognizes them as the strongest advocates for children outside of the home. In contrast to her opponents’ promises of returning to Brownback-style attacks on public schools, Senator Kelly’s platform includes a comprehensive vision to strengthen educational opportunities for Kansas students from pre-kindergarten through high school and beyond. 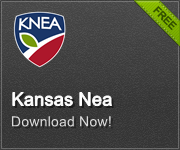 Kansas NEA’s KPAC is comprised of KNEA members throughout the state who determine criteria for recommendations and interview candidates seeking KNEA’s recommendation in state races. The candidates who earn “recommended” status have demonstrated a commitment to strengthening public education in Kansas. CLICK HERE to download today’s press release. 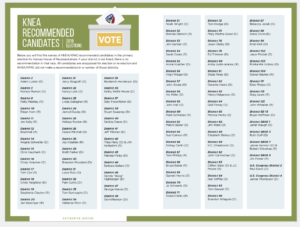 KNEA has released the full list of recommended candidates ahead of the November Election. CLICK HERE or click the image below to view and download the list. KNEA & KPAC are continuing to interview candidates ahead of the upcoming primary elections in August. As we have new recommendations we will continue to update our recommended candidates list and use our Under the Dome advocacy blog to distribute these updates. There are new recommendations for House Districts 13, 27, & 107. In House District 13, KNEA/KPAC recommends the re-election of Rep. Larry Hibbard (R). In House District 27, KNEA/KPAC recommends the election of Karen Snyder in the Republican primary. In House District 107, KNEA/KPAC recommends the re-election of Rep. Susan Concannon (R). We expect to have another update after the weekend. Today, the Kansas State Board of Education conducted an unscheduled meeting to respond to yesterday’s letter from House Speaker Ron Ryckman and Senate President Susan Wagle accusing Deputy Commissioner of Education Dale Dennis of distributing certain transportation funds without authority to do so. The letter also directed the board to suspend Mr. Dennis from employment while an investigation is conducted. CLICK HERE to read the complete details behind this accusation. Over the last 24+ hours, the education community throughout Kansas has expressed rock-solid support for Mr. Dennis. That support overflowed on social media but also within the boardroom at today’s hearing where dozens of education professionals gathered as a show of solidarity. Upon convening the meeting, it was announced that there would be two closed executive sessions. The first was for the purpose of consulting with board attorneys and the second was to discuss how to handle the employment issue relative to Mr. Dennis and in response to the Ryckman / Wagle letter. After the second closed-door session, a motion was put forth by board member Sally Cauble. In her motion, Cauble stated that the board’s duty was to advise Commissioner of Education Randy Watson when requested regarding employment matters. Further, Commissioner Watson had requested guidance from the board. Cauble’s motion recommended to “fully support continued employment for Deputy Commissioner of Education Dale Dennis and his staff.” The motion passed 9-1 with board member John Bacon being the sole no-vote (according to media reports). 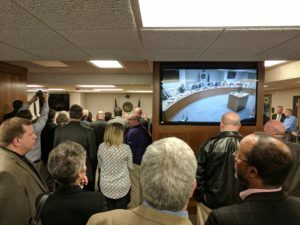 While today’s proceedings captured the attention of nearly everyone within the education profession, our soon-to-be Governor, Jeff Colyer, was conspicuously silent and thus far has not weighed-in on the issue. However, four former Kansas Governors, as well as several state leaders, pledged support for Mr. Dennis prior to today’s hearings.